So aside from doing this whole snowflake-a-day project, and also a test knit due by the end of the month, and oh let us not forget that whole ‘working full time’ thing and also rehearsals and so on, this month also is the start of my workplace’s ‘let’s encourage everyone to be more active’ annual challenge. And this year the deal is that in order to meet the challenge, we have to walk 350,000 steps in between February 2nd and March 28th. Technically that’s only 6250 steps per day except that you get extra brownie points if you hit 10,000 per day, or something. Huh, I could really go for some brownies right about now. Mmm. Brownies. Yesterday I flew to Atlanta for work. There were lots of extra steps getting to the airport and getting to my gate, but by the time I landed in Atlanta I was still a couple thousand shy of the goal. So instead of taking the gate shuttle, I just walked the extra-long hallway, and while waiting for the MARTA train to arrive, I paced up and down the (rather long) platform, so that by the time I got to the hotel (also more walking, from the MARTA station) I was only a couple hundred shy, and that I was able to make up by pacing around in my room. Today I had grand plans to get up early and go walking, except that as I sat on the bed, blinking blearily because the brain does not shift so easily from west coast to east coast time zones, the skies opened up and it began pouring. And I am sorry, no brownie points are worth getting drenched. Anyway, all throughout the day my coworker (who has also signed up for the challenge) and I have been finding ways to sneak in a few extra steps here and there, and we even picked a location for dinner that was half a mile away, just for the extra steps. One should never underestimate the allure of mythical brownie points. So at this point, two days into the challenge, I’ve hit the goal every single day. Go me! Also, my coworker and I are meeting tomorrow morning at 6am (which, those of you paying attention to what I said earlier may note, is actually 3am to my west coast brain) so we can try to knock out a big chunk of the 10K before the meeting gets started. Whether one or both of us then dozes off during the meeting later is anyone’s guess. I sense tomorrow is going to involve caffeine. A lot of lovely, lovely caffeine. 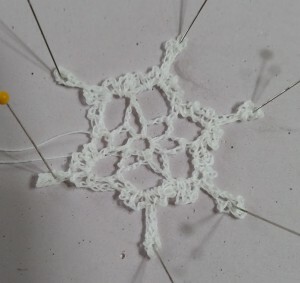 Today’s snowflake technically was made yesterday, because I did not feel like dragging along all the parts to make them while traveling, but as this is my personal challenge I get to make up the rules as I go along, so there. I did not, of course, make tomorrow’s snowflake early, so I sense that I shall be blearily crocheting what I am sure will be a *lovely* snowflake at roughly 11:30 pm tomorrow night when I get back home, but oh well. Clearly I need to spend a lot more than 30 seconds pinning these things out. You can see that there is still that weird little lump where the circle joined, but I figure anything that is less lopsided than yesterday’s has to be counted as a win. *No, I am not sorry for the earworm. Not sorry at ALL. Good for you! I walk at least four days a week, but I don’t even come close to that many steps. I might get to 3500 on a good day.